How’s December going for you?! Are you ready to start wrapping gifts yet? I’m always a wait until the last minute kind of gift wrapper. 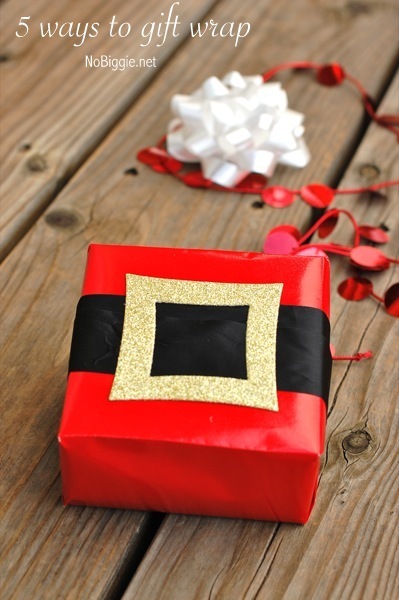 Here’s five fun and festive ways to gift wrap this year. Santa’s Belt: little ones will be so excited to see a gift wrapped up just like Jolly Old Saint Nick. 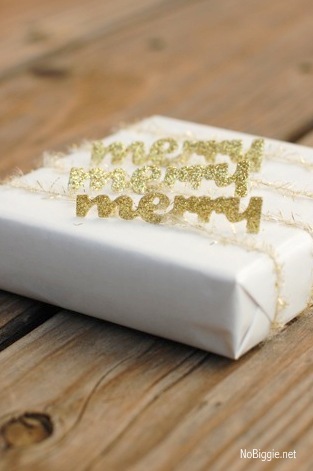 Merry-Merry-Merry: simple text popping up off the gift wrap is a fun way to top a gift. Plus when add gold glitter, it’s even more glam! 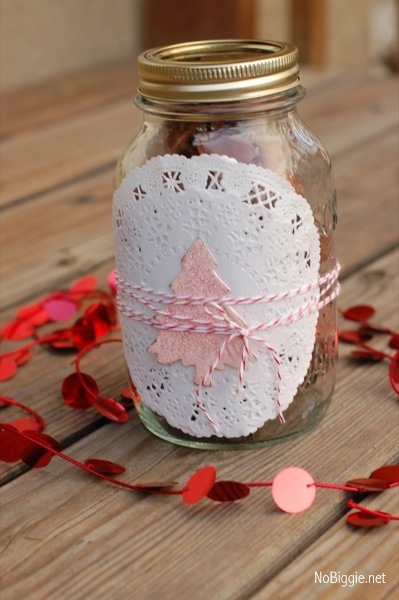 Mason Jar Wrap: A mason jar with a pretty paper doily and baker’s twine. Raise your hand if you love using mason jars to wrap gifts! If so, here’s a fun list of 25+ different mason jar gift ideas. Pink and Peppermint: I have a thing for pink at Christmas. 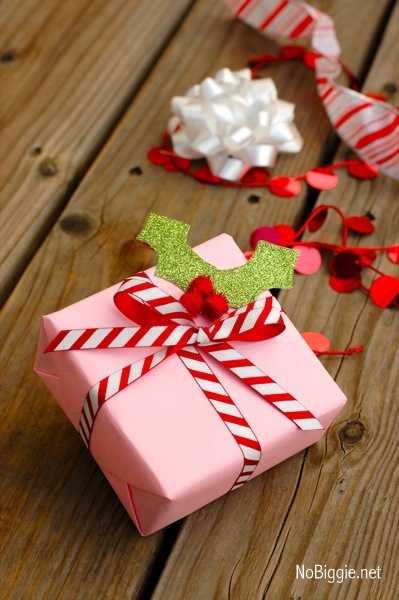 Pink paper with a peppermint striped ribbon is such a cute way to wrap a gift for a girl…especially a girl who loves Pink! Snowman Tags: You know those simple white tags that you use to label extra keys?! Grab a slim sharpie in orange and black and add a cute little snowman face. Also, hang onto the colorful mesh bags that your produce items come in and you can reuse them as gift wrap like you see here. Which way is your favorite? 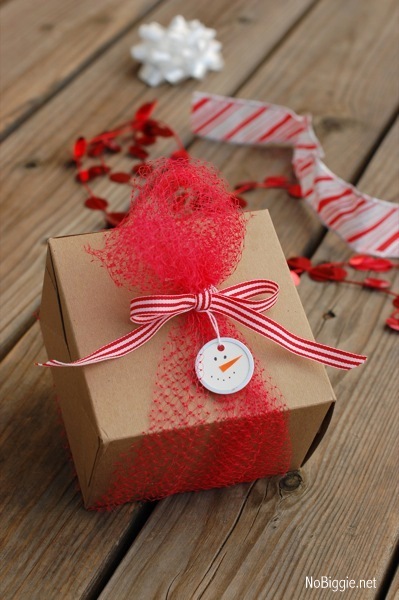 Do you love to get creative when it comes to wrapping and topping gifts too? So many adorable ideas here–thanks so much for sharing! I love the Santa costume wrap in particular 🙂 Hope you have a great weekend and best wishes for the holiday season.